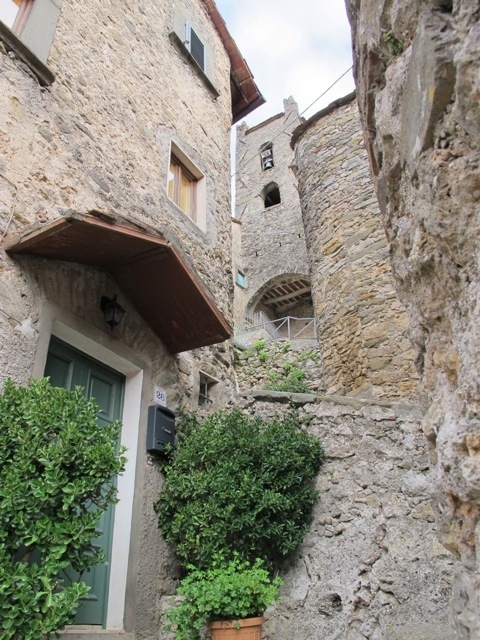 Legend has it that Cocciglia was built on land owned by a Roman settler named Cocilius. Only about 80 people now live in the village. 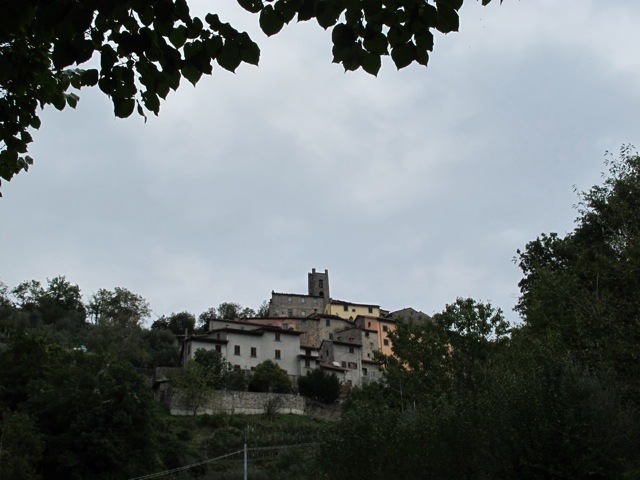 It was once an important fortified town which guarded the road leading to Controneria, further up the mountain. There is a short road to the village from the Brennero Road. 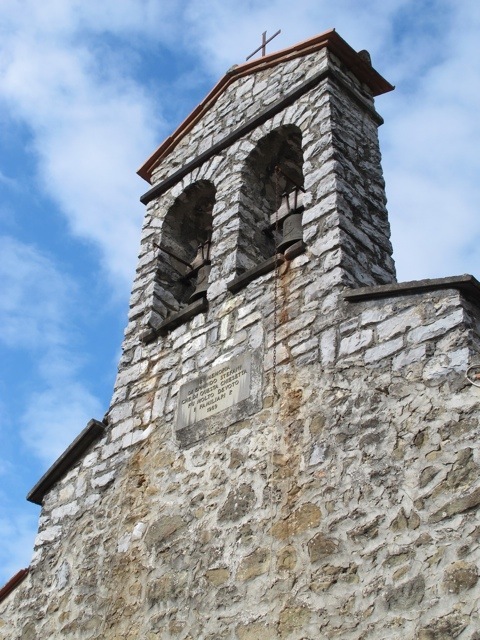 On the way is a small church with an impressive bell tower. The village comes into view just around the corner from the church. There is also a view across to Pallegio. There is a walking path opposite the church which appears to lead to the village above. I took the easy option and drove up the road to the tiny parking area just outside Cocciglia. Come for a walk through the little village. The church is right at the top of the village. 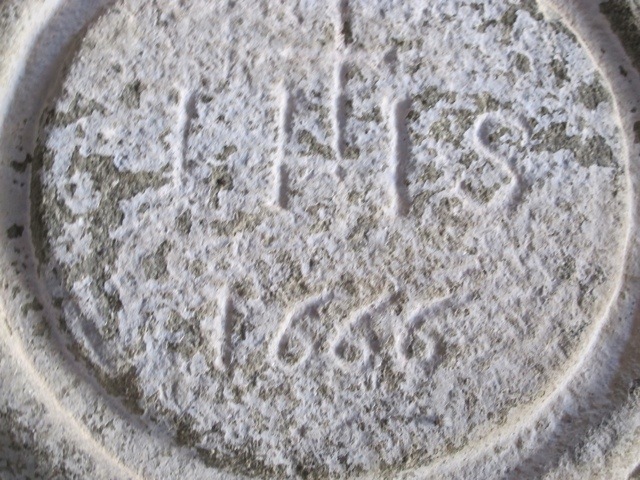 This is the stone over the door to the church. 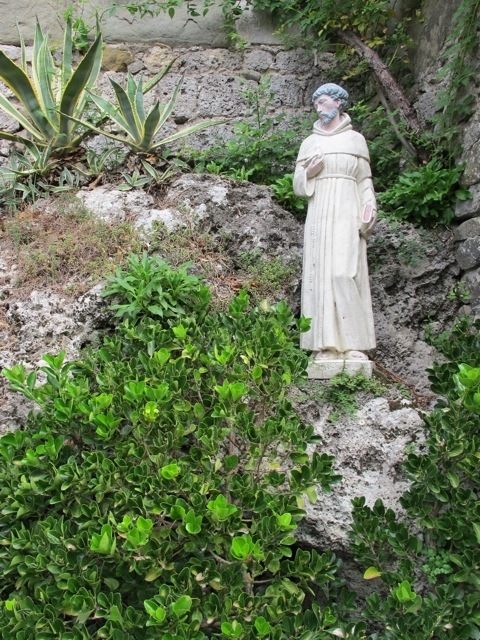 On the way up to the church is this quaint statue. I found the next colourful image on the front of a house. I saw no people on my walk, but the village is obviously lived in. There are pretty gardens and the houses are in good repair. The village is no longer isolated, but I can’t help thinking about the lives of people who lived here centuries ago. This place is tiny and life must have been tough. I hope the residents from the past occasionally had time to sit back and enjoy the view. 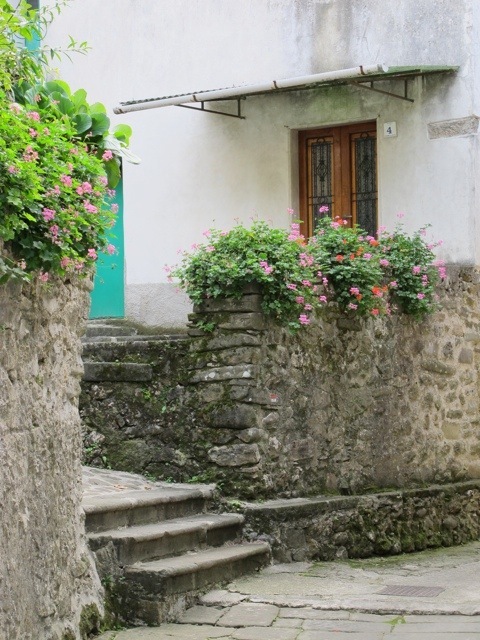 This entry was posted in The villages of Bagni di Lucca and tagged Bagni di Lucca, Cocciglia, Italy, mountain villages in Tuscany, photography, travel, Tuscany by Debra Kolkka. Bookmark the permalink. I walked on the cobbled path across from the lower church and you’re right, it does lead up to the village. In the other direction the path continues along the side of the church and on down into the valley. I think it’s the old road to Palleggio, but I haven’t checked it out yet. 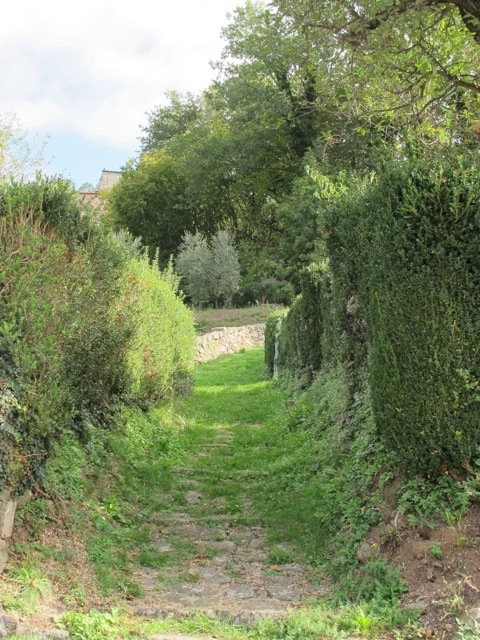 There’s another ancient cobbled road that leads out of the village about halfway up to the church at the top. It becomes a CAI trail (actually CAI probably co-opted one of the old mule tracks) and after about an hour ends at a torrential river with no bridge or obvious means of crossing. I’m going back in summer to see whether there’s a ford. I think it will connect to a trail from Limano. Maybe the world behind the villages should be your next project? All those beautiful old villages! 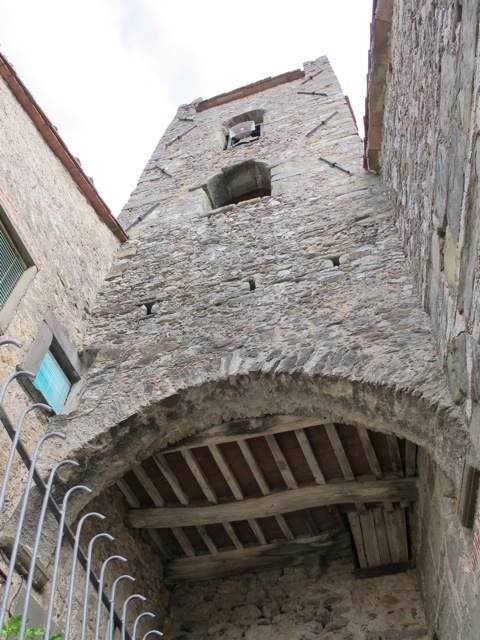 Look at the dates on some of the buildings, 1498, 1666… I do hope that people will not abandon them, as it has been the case with other villages. Once the local shops disappear from the villages it becomes more difficult to live in them. You need to be very well organised. Lovely sentiments Deb. maybe it’s Christmas but I was really moved by this little village. I would live the prickly pear in a pot waiting under my tree! Thank you as always. It did seem a bit lonely up there. I will have to go back at a busier time and meet some locals. What a lovely little village. I hate that the population keeps getting smaller in so many of the villages…some have been almost abandoned. Some of the villages have very few people living in them. There is not a lot to keep young people busy. That seems to be happening everywhere. Young people move to the big cities for work and an exciting lifestyle. I guess you can’t blame them. Maybe they will return when they are a bit older. I thought it was very cheerful. I hope the communities can survive, but at the moment in the some of the smaller villages the prognosis does’nt look so good. There’s a ‘tipping point’ in all of this. If population drops below a certain level and (as you say) if the village shop disappears, young people will not be encouraged to stay let alone move in. This must be something which successive Italian governments are aware of. 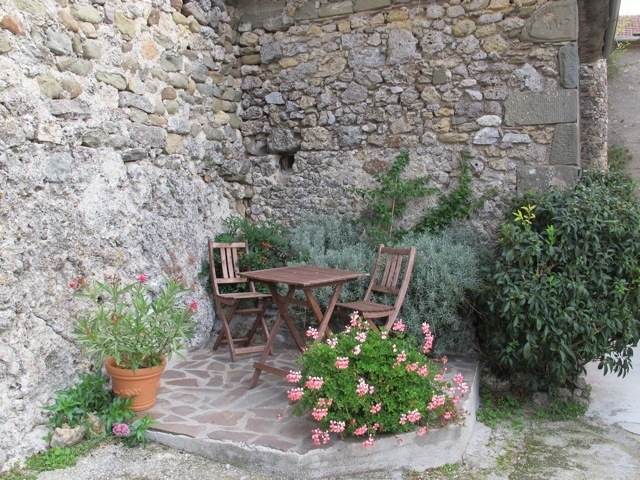 There are ways to attract people to rural locations (not that rural – Lucca’s only 30 minutes away in a car! ), usually by offering some sort of tax break. I just wonder if there is a strategy in place to ensure that there villages do not fail? I doubt there is a strategy for anything much in Italy, let alone small villages. The best hope is if people who have moved away come back to reclaim their houses. The other way is for foreigners to buy houses and bring them back to life…as long as they spend a reasonable amount of time in them. It is not much use if people buy them and leave them empty most of the year, that doesn’t help much. It would be a pity to lose these villages, but they have to be attractive places to live, with a few facilities. Hello, I can tell you that we are fighting for the beauty of Cocciglia ! 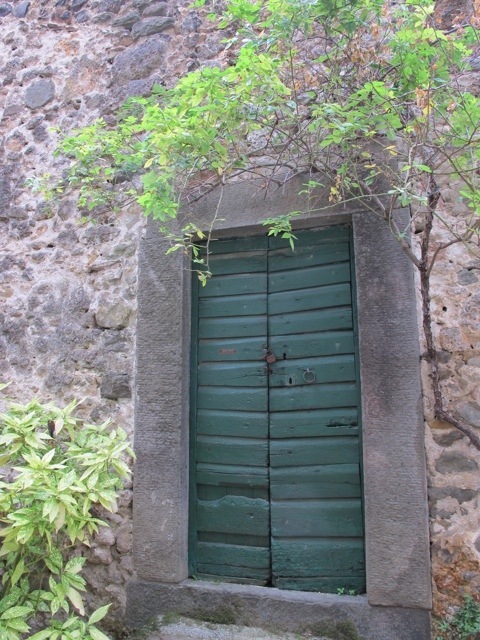 There are only 20 people living there, but we are doing our best… We have created 2 B&B(http://www.cocciglia.com), I wish we can go on for a long time ! My oncle is born there, in the 1666 years old house, and when he died, we decided to come back and take care of the house and his ground. Now, we have a very peaceful life, in a beautiful place ! You are welcome ! I would like to come to see your B&B and take some photos if you would like it. The young people started leaving these villages in my youth, not long after the war. Some would love to come back but cost of renovations, taxes, etc. is too high, especially for a second home. Work is hard to come by for the young in Italy and the Italian bureaucracy makes it very hard to start a business. It is very sad to see these villages dying off but unless the gov’t makes it a little easier to run a business, I see no hope. The young are looking to go abroad for work. After the war people also had fewer babies, so the populations in these villages began to fall quickly. I can see the problems young people in Italy are having and it upsets me. I wish the government was doing a better job at making life easier for small (and large) businesses. I am hearing more and more Italian in the streets here in Australia…young people looking for a new life. The Bagni di Lucca comune needs to do a bit more to encourage tourism. The area has a lot to offer, but people need to hear about it. We live in this village. We are English, so yes we do fall into the category of foreigners taking over some of these old houses. However, we are there throughout the summer and about once a month in the winter. The village has a wonderful soul and there is plenty of community spirit. Actually there are about 80 inhabitants, many living there fulltime. Perhaps they were huddled by the kitchen fire when you visited! Many of the owners have lived there their whole lives. It is true the young have moved to nearby cities for work but do tend to be there at the weekends. 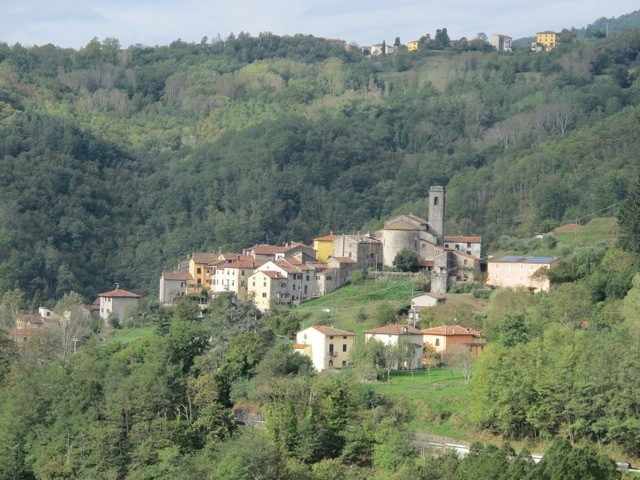 Cocciglia is a lovely village, how lucky you are to live there for some of the year. The afternoon I visited and took these photos was late summer. Perhaps the residents were enjoying a rest. I spend about 6 months a year at my place in Ponte a Serraglio and we have lots of Australian friends staying at our place when we are not here. I think it is great that the houses are being lived in. I hope to meet some residents on my next visit to Cocciglia. Hello Debra, I will be happy to meet you ! May be we can have lunch or dinner at home ! You will be welcome. 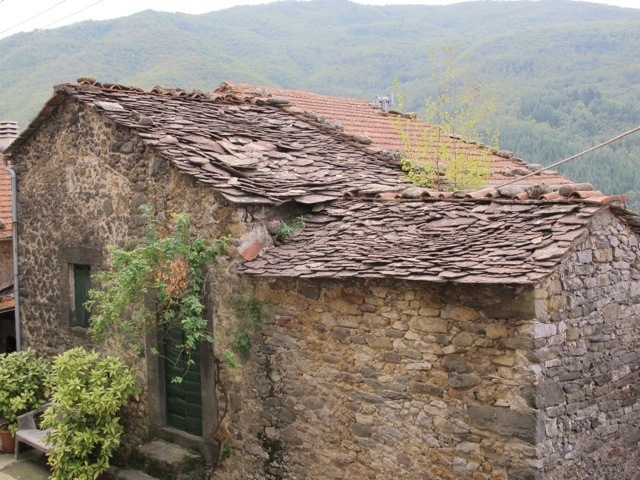 I actually spent quite a few summers as a little girl in Cocciglia. 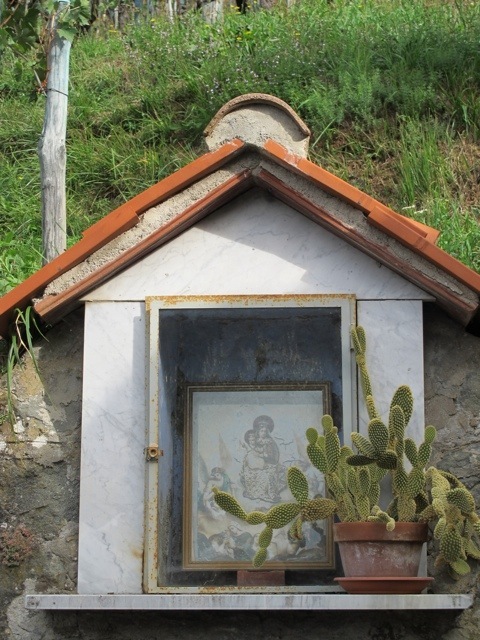 My late great uncle was the local priest and he resided in the house directly across from the entrance of the Church of Cocciglia. 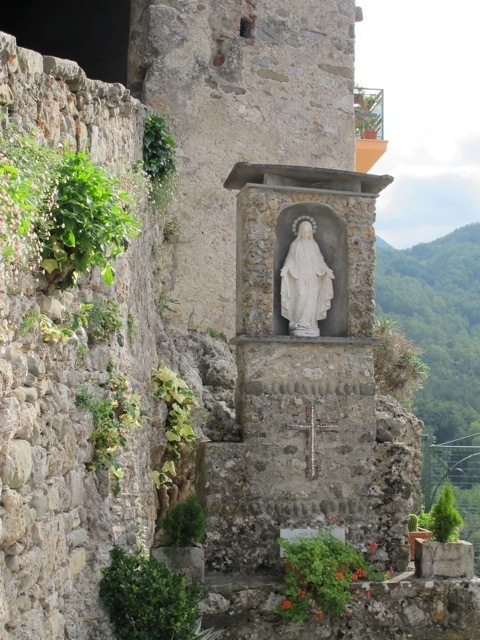 I made many friends in Cocciglia and loved roaming the cobblestone paths. The home has a beautiful back garden area, where even now, the swing, and some of the statues that my uncle put in the backyard for me over 40 years ago, are still there. 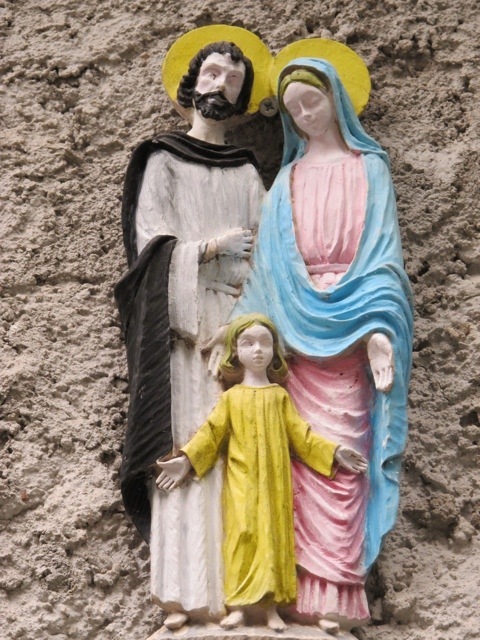 Snow White and the Dwarfs in the grotto, the Madonna in the larger grotto, Santa Claus and Bambi. The back garden area is closed in by a chain fence but it offers a stunning view of the Bagni di Lucca mountains and of course Palleggio. 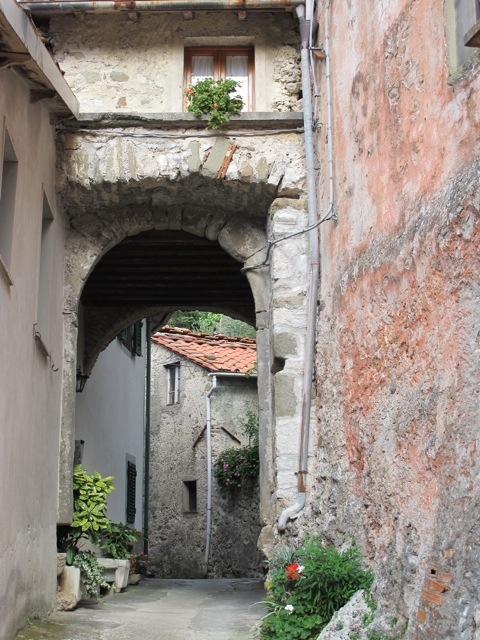 Every time I visit my family in Lucca, I take a ride to Cocciglia and reminisce in my beautiful childhood memories of my summers in Cocciglia. I have brought my husband and sons to share in the beauty of Cocciglia and mom’s young childhood summer playground. This is one of my most favorite places in Tuscany for its history, architecture, view and ambience and of course my memories. Thank you for taking the time to leave a comment. I love writing the blog about our villages. I think they are wonderful and need to be shared with the world. What makes it especially rewarding is when I get responses like yours. Thank you for taking the time to leave a comment. I love writing the blog about our villages. I think they are wonderful and need to be shared with the world. What makes it especially rewarding is when I get responses like yours. Thank you for the stories of Cocciglia. My Nonno was born in Cocciglia in 1908. He grew up there before he came to the U.S.A. In the 1930s. It seems Bagni di Lucca had shared many of its residents with the world. We are a couple from Denmark and we bought the house located at the tip of town towards the river. 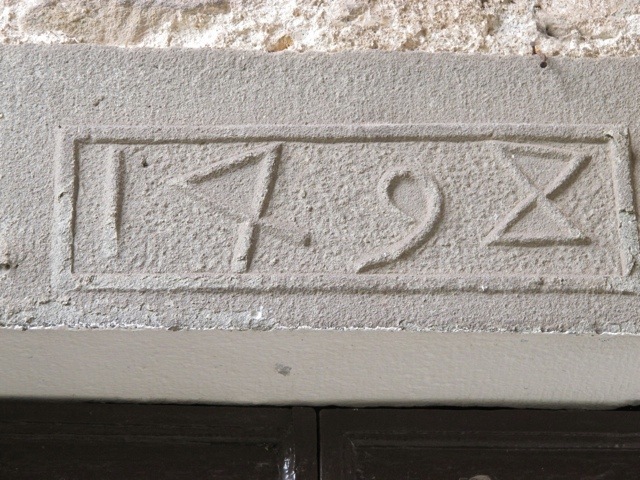 The adress is “Il Balzo di Boni” meaning something like Boni´s hanging cliff. We are moving on rebuilding the house which we took over from our friends in the autumn of 2014. They started restoration in 2009 when it was classified a ruin in the communityfiles, and they did a huge work. We are not yet able to stay there more than a few weeks a year but we look foreward to our retirement in some years. Then it is our plan to stay there a lot. Friends and family of ours and the ones we bought the house from use it too. 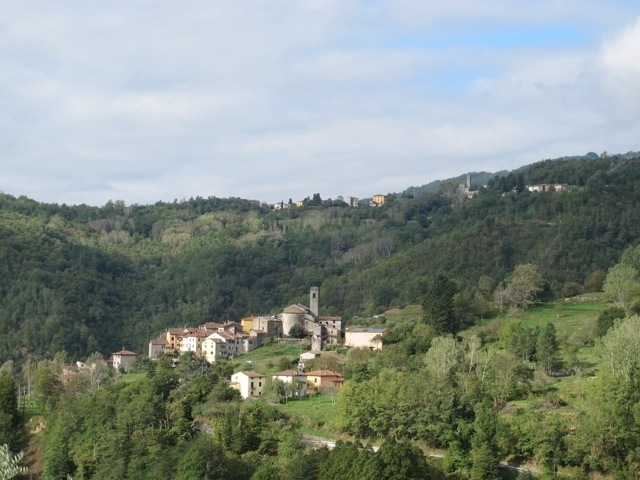 We absolutely love Cocciglia and the surrounding area including Bagni di Lucca, and I think this blog is a very good advertising. Thank you for taking the time to leave a comment. 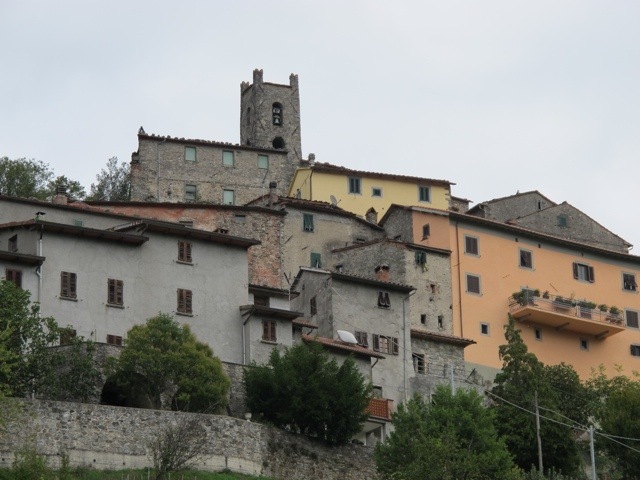 I love the villages of Bagni di Lucca too. Each one is different and has something special to offer. It is good that you have family and friends stay in your house, we do too. It is a pity when people buy in the area and leave the houses empty for most of the year. It really doesn’t help the local economy much at all. 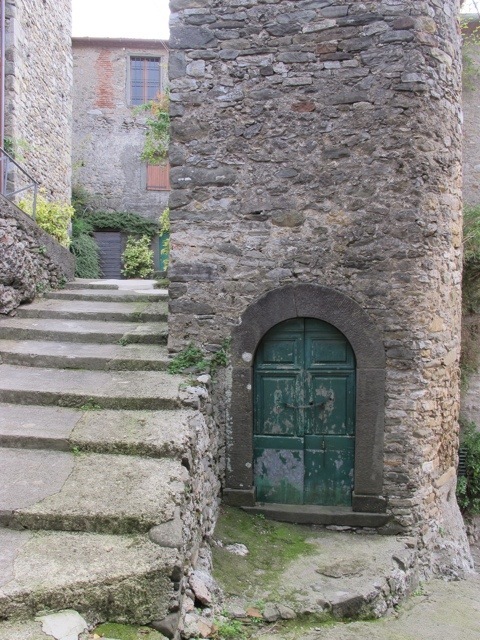 Please share the blog with everyone you know…help spread the word about Bagni di Lucca. I have just left Bagni di Lucca to return to Australia for a few months. I miss it already.